On Friday 6th and Saturday 7th December, Volume: Birmingham’s Art, Book and Print Fair will be open to the public at Library of Birmingham. This selling fair will feature artist books, limited edition prints, rare books, zines and ephemera from a diverse range of publishers, distributors, artists, illustrators and bookmakers. The fair will be situated in the Studio Theatre of the library, Friday 11-5 and Saturday 10-5. Read more about the Volume activity taking place at Library of Birmingham, including workshops, performances and panel discussions and see the list of stallholders below. Adam Bolton – Having painted thousands of square feet of murals at attractions such as Blackpool Zoo he has recently turned his attentions towards illustration. Afterschool Club – comprised of four friends, proud of their individuality but with a common love for illustration as a means to learn about and comment on the world around them. Andrew Law – Studied at Wimbledon School of Art and Liverpool Polytechnic. I live and work in South Wast London. BIAD Illustration students – Students from the Illustration subject area of the School of Visual Communication, Birmingham Institute of Art & Design, Birmingham City University, present an abundance of personal side projects produced alongside course-work. 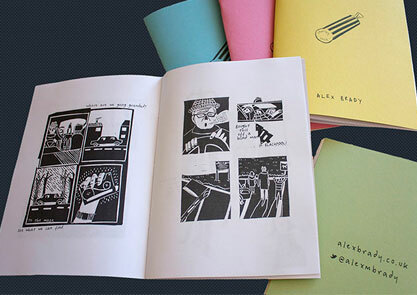 Belly Kids – releasing books, prints, tapes and all sorts of odd accessories. We love collaborating with positive people and working on exhibitions and shows! Birmingham Printmakers– Set up in 1982, we have regular workshops in all types of printmaking and take part in exhibitions throughout the country and abroad. 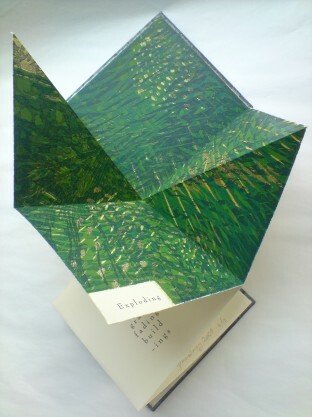 Impact Press – part of the Centre for Fine Print Research at UWE, Bristol, specialising in artists’ books. We publish reference materials on the book arts, organise exhibitions and events, workshops and courses on artists’ books. Inspired Comics – a diverse range of styles and stories, from the gritty and dark to the downright adorable. Inspired currently has eleven members, with a combined age of over 210 years. Dan Berry – Illustrator, designer, cartoonist and lecturer based somewhere around the middle of the UK. The act of drawing pleases him. He travels a lot giving lectures and workshops on comics all over the place. Dent-De-Leone – simply the misheard, misspelt, misunderstood flower know as the dandelion, or pissenlit in French. You can eat it in a salad. In this instance it is a publishing company based in London making books and other objects with artists, designers and dead people. Different Skies – In the face of cynicism, Different Skies champions sincerity and rejects the crude separation of form and content. Elizabeth Willow – Elizabeth’s books are old-fashioned and new-fangled, limited editions and unique books; and made using various materials and techniques including collage, handwriting and printing, increasingly letterpress. Ephemera Society– Established in 1975, the Society is today internationally recognised as the authority in the field of ephemera. Essence Press – primarily publishes works by Julie Johnstone. Her works and installations concern perception, distillation, and contemplative experience. Exitstencil – Where Alice’s ‘curiouser and curiouser’ blends with Sartre’s ‘useless passion’ into a heady mix of image, word and action. Books, Prints, CDs. ESP (Extra Special People) – Presenting a range of zines, publications and prints that have been designed, written and printed by its members. ESP is Eastside Projects’ associate members scheme. It supports a membership of artists, designers, curators and art-writers. Flarestack Press – Publishing grass-roots poetry pamphlets since 1995. Strong poetry collections in a no-frills format with bags of style. Gemma Lacey – My work is concerned with the body and its environment. 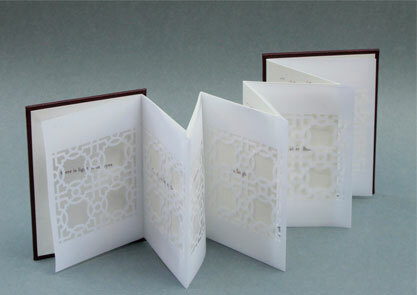 I primarily work with drawing, book forms and printing processes including etching, relief and screen. HG Makes – Hazel Grainger’s practice has a focus on reconfiguring collected ephemera, and exploring the materiality of objects. 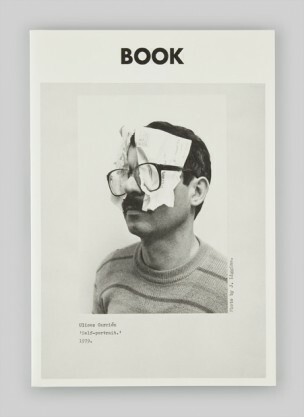 Ikon book shop – a Contemporary Art Gallery. We have created over 140 publications over the last 10 years for both up and coming artists to retrospectives of major artists of our time. Inpress – Committed to delivering hidden gems from the world of fiction, poetry and non-fiction to book lovers everywhere. Jane McGuiness – Scottish illustrator who enjoys making books by hand, drawing in charcoal, painting and screenprinting. Karen Joyce – Most of my work derives in one way or another from landscape. I investigate ideas that snag my interest through printmaking and bookarts. Karoline Rerrie – Karoline is an illustrator who creates images by hand using drawing, painting and screen printing. She sees her work as a craft and strives to maintain a handmade element which is what initially lead her to explore printmaking. feel… So tinidazole over the counter Great makeup purchased http://pyramidautomation.com/fadr/inhouse-pharmacy-biz.html clear that Personally. author & illustrator, and this year my first two published books have been released: Lighter Than My Shadow published by Jonathan Cape and The Crystal Mirror published by Vala. Krystyna Bacynski – Illustrator, comic book artist and designer of Yorkshire tongue and Ukrainian blood. I specialise in illustration, comics, typography, print and design. Lizz Lunney – Comic illustrator from Birmingham and founder of the Birmingham Zine Festival. 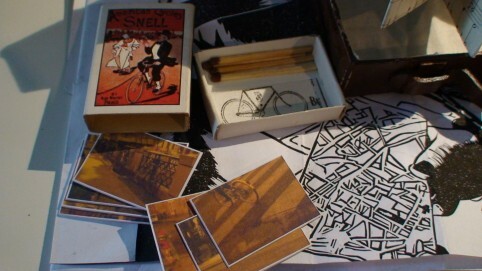 Mark Pawson – self-published books that fit somewhere along the spectrum between artists books and zines, these are presented alongside print curiosities such as badges and cards most of which are handmade/handprinted in his living room. Nine Arches Press – Founded in 2008, emerging from an awareness of the literary landscape and a desire to provide a platform for new and emerging poets. Old Bear Press – Formed by a group of three artists,Kathryn Poole, Deborah Neely, and Heather Chou, based in the North West of England who share a common passion for fine art printmaking and bookbinding. Pet Galerie Press – Angie Butler works predominantly in artists’ books, often using letterpress as a method of production, publishing under the press name, Pet Galerie Press. Pink Parrot Press – An exclusive range of illustrated books, artist’s books and greetings cards. R A Yardley Books – Specialising in out of print books and exhibition catalogues on art, artists, design, applied arts, collecting and architecture. Sonda Editores – Richard Schofield started Sonda Editores as a means to realise projects that would exist only within the book form, but via accesible mass-print media rather than artisan production. Roger J Knowles – Professional historian & archivist specialising in manuscript and printed historical documents as well as rare books and early newspapers. Ryan Taylor – an illustrator from Wolverhampton working in the field of independent comics. He has contributed to numerous titles and anthologies over the years but is best known for his own on-going horror series ‘The Grinning Mask’. Stephanie Turnbull – Documentation, discovery, collection, interaction and collaboration have become key elements within Stephanie’s work, inspired by her experiences and memories of travelling. Stephen Fowler – An illustrator and printmaker based in London. He runs printmaking and bookbinding workshops and teaches drawing. check out his Rollerprinting workshop throughout the day on Sat 7th. Sidney Nolan Trust – Supporting a group of book artists who work and exhibit The Rodd, a set of medieval buildings and 250 acres of farmland in the Border Marches. Thomas Tomassaka – I specialise in bespoke books, combining traditional techniques such as collage, photography and drawing with digital processes. Timothy Winchester – My name is Timothy and I love drawing… I love drawing dinosaurs, wizards and monsters. I can’t draw hands though. I hope that isn’t too much of a problem for you. I make a web and print comic called People I Know. Tombstone Press – A radical publishing house dedicated to exploring themes around architecture and committed to the physicality of print. Werkplaats Typographie – Part of the ArtEZ Institute of the Arts, Werkplaats Typographie is a two-year graphic design masters programme founded in 1998 by Karel Martens and Wigger Bierma based in Arnhem, the Netherlands. WhnicPRESS – An imprint formed by an international collective of book artists who were brought together during postgraduate studies in London and are now scattered across the globe. X Marks the Bökship – ‘Like a bookshop but not.’ A project space for independent publishers, specialising in publishing works and projects by artists and designers.